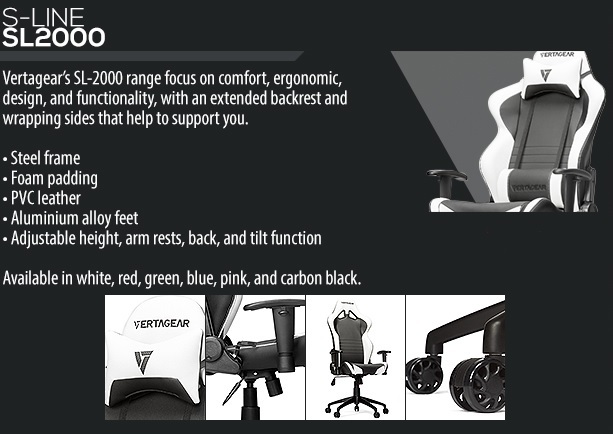 A combination of form and function, Vertagear Racing Series S-Line SL-2000 series gaming chair focus on ergonomics, design, and functionality. Designed to give wide range of adjustability that gives gamers the best comfort and support in every gaming position for extended period of time. High backrest is designed to provide neck, shoulder and lumbar support. Cushioned and contoured to the shape of the arm with adjustability in height gives support to the gaming arm and prevents repetitive stress. The SL2000 is made of high quality PVC leather, which makes it extremely durable and gives the chair a luxurious look. This material is easy to clean and maintain due to it’s stain- and water-resistant characteristics. The SL2000 padding is made of high densed foam, which adds great support and seat comfort to the chair. The open-cell breathing structure, makes sure that heat arised from the human body temperature won’t get trapped inside. This gives great comfort to the user even when seated for extended period of time. The SL2000 is constructed from a steel frame that assures a solid structure. The aluminum alloy 5-star base keeps the chair solid, stable and lightweight. Assembled with a Class 4 gaslift, iindicates for better durability and ease of use. Our Class 4 Gas Lift has thicker walls to accommodate the higher pressure and stability. Wheel is formulated for a quieter operation and greater resistance to foreign objects and debris.